My wife (Sue) and I recently spent three weeks travelling through parts of Central Australia. 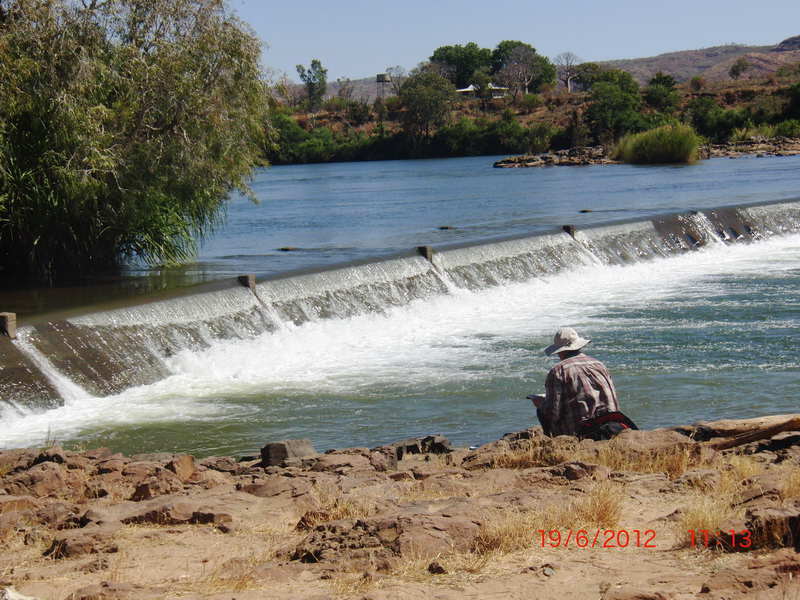 We travelled around the Kimberley region of Western Australia and finished up at Alice Springs in the Northern Territory. Most of the time we were on a organized tour. So I thought I would cover some issues to consider when trying to do some plein air painting with watercolor, and pen and ink, in such circumstances. Mainly I am going to cover the amount of time you have to paint and constraints on your materials. 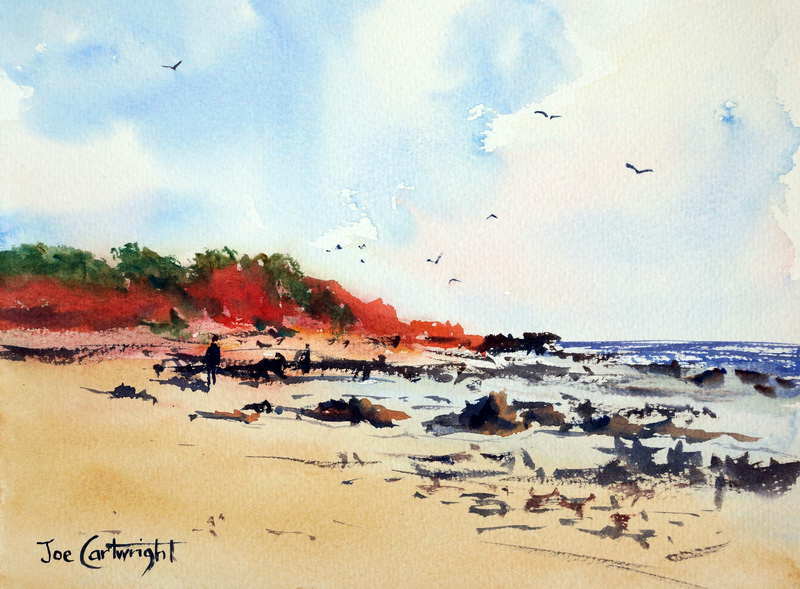 My first plein air watercolor panting was of Cable Beach, Broome, WA. I used a large rock on the beach as a support. A bit hard on the knees and not recommended! 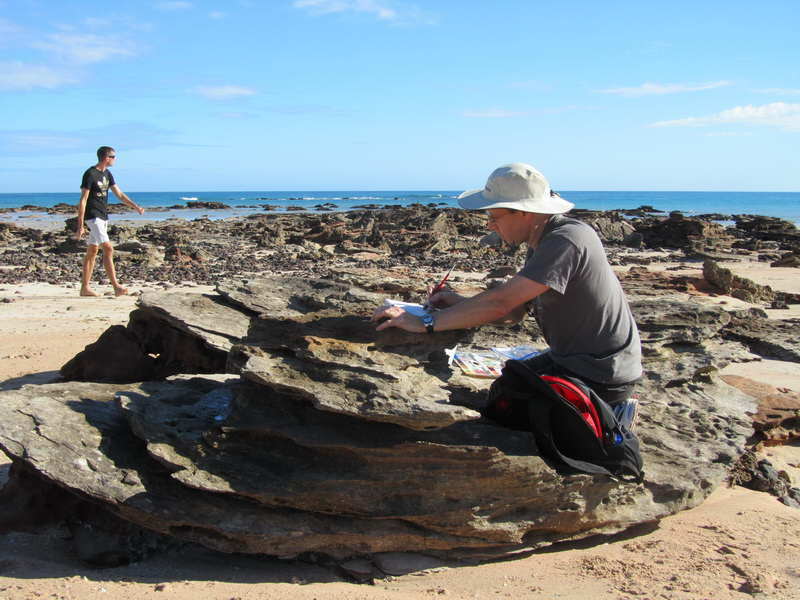 As with all things there is plein air and there is plein air. What I mean by this is that a lot depends on just what type of painting trip you will be taking. 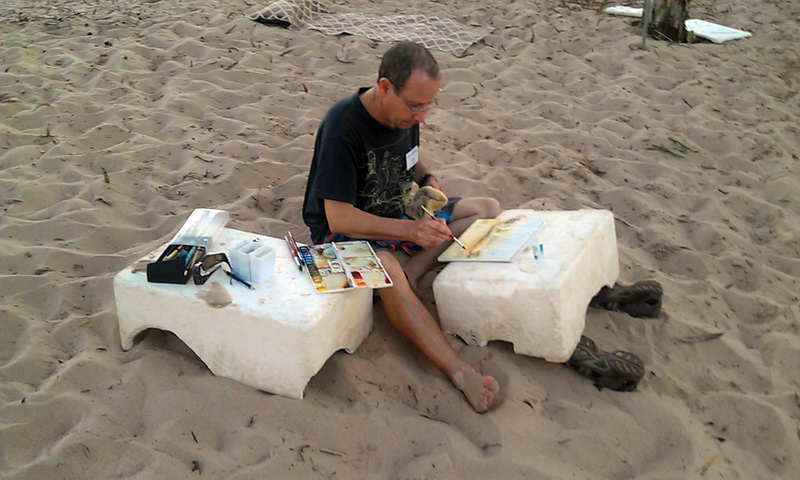 Is your trip purely for painting or is it a general tour or holiday during which you want to do a little bit of sketching or painting within a limited amount of time? I have already written one article on Plein Air painting tips which you can find on my website at this location: Watercolor plein air . 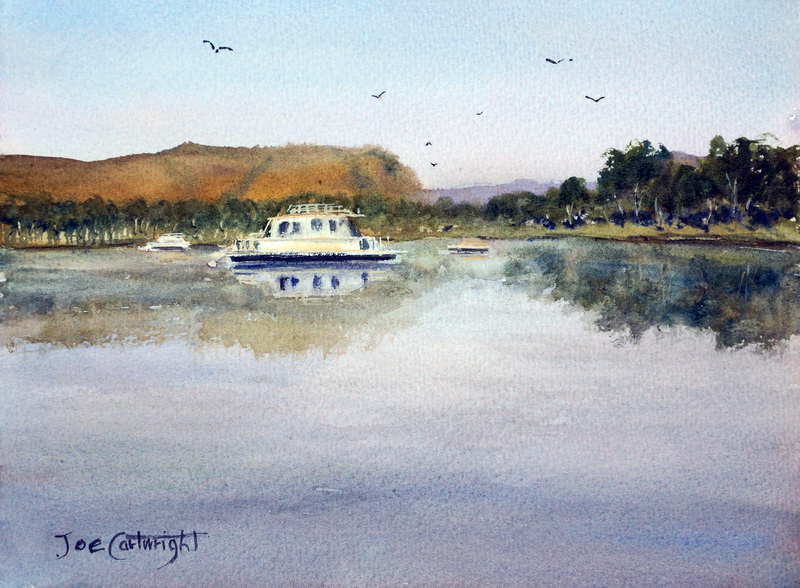 In this article I want to discuss how to tackle plein air painting while travelling as part of a large non painting group with a relatively fixed agenda as I had the pleasure of travelling on. An organized tour puts certain constraints on you. The most significant is on your timetable. This limits the amount of time you can have for sketching and painting before you have to move on. If it is a tour where you are constantly up and down from a bus you will also have limited space for carrying your gear. If you are on such a tour you basically have to decide if you are just going to get out of the bus and start sketching or wander around with the rest of your group maybe taking photographs as future painting references. Most often you will go with the group so sketching will not happen. You just will not have the time to do both. Every now and then you will find a spot you just have to get down on paper in which case that should become your priority while keeping time limits in mind. When I have a very limited time to sketch I prefer to use pen and ink as it requires less set-up and dries relatively quickly. 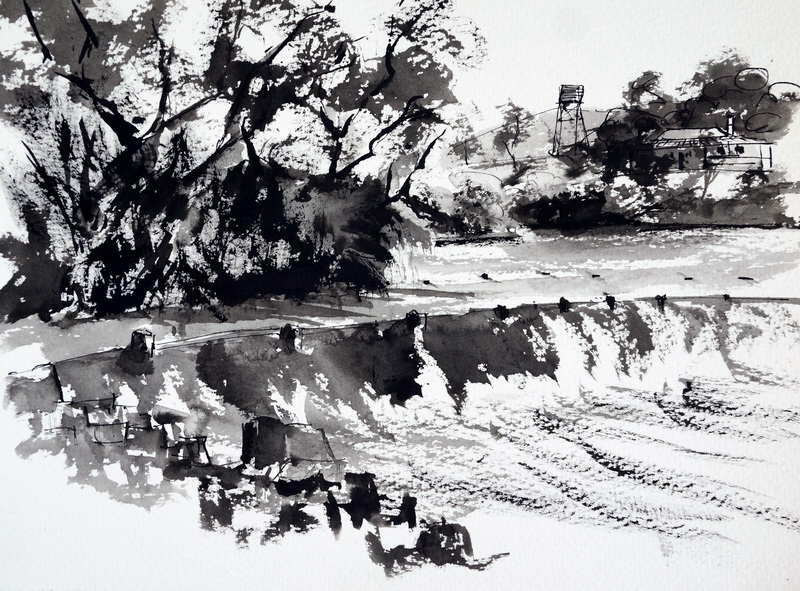 Below you can see one of the sketches I produced on this trip in pen and ink. I only had 30 minutes from the time the bus stopped, everyone had morning tea, and headed off again. I was one of the first off the bus and the last on! I found a comfortable rock and placed my watercolor pad on my knees. I had to sketch very fast as time was short. I almost always take more equipment with me than I need, even though I keep paring it down. This trip was no exception. At the start of the tour I carried most of my painting gear in my day bag in the cabin of the bus as opposed to the rest of our clothes etc. which were in bags stored till the end of the day when we had to set up our camp. By the end of the trip I was carrying only my small pen and ink kit in my day bag and only painted with my watercolors at the end of the day if time and light permitted. 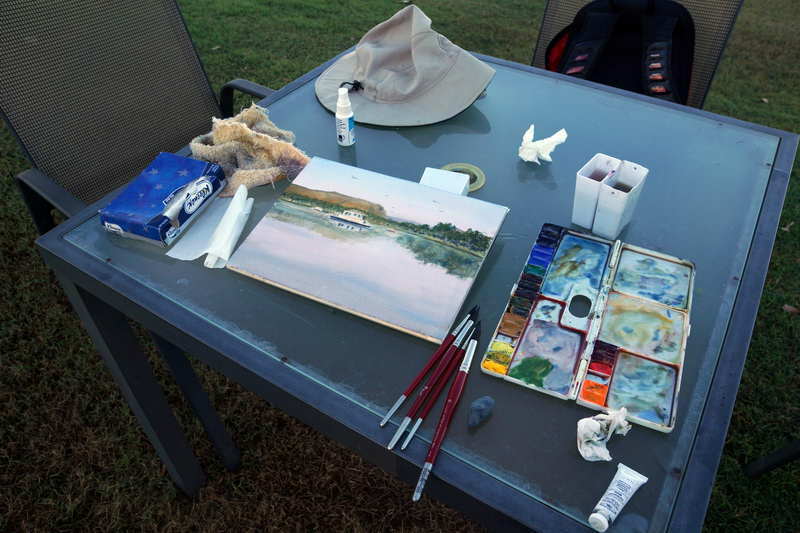 Below is a photo of my plein air painting kit I used for my watercolor paintings. It is quite basic with my main attention on keeping it light and practical. If I was on a dedicated painting trip I would have a tripod, larger paper supply, and a more sturdy metal palette. Because I knew time would be limited (though it turned out to be even more limited than I expected), I only took a small Arches watercolor cold press block to paint on. It’s size was 30cm x 23 cm. This small size allowed me to paint quickly and reduced the amount of detail I had to worry about. Using a block instead of separate sheets meant I did not have to bother with taping my watercolor paper down onto a board. As I didn’t have an easel I mostly just sat down at any convenient spot propped up my watercolor pad as best I could and got straight into my painting. On my next such trip I will only take a tiny palette preloaded with watercolors and a small pen and ink set. The watercolor block was just the right size and it will come along too. Here are a few more photos of the watercolor paintings I did and of me painting them. 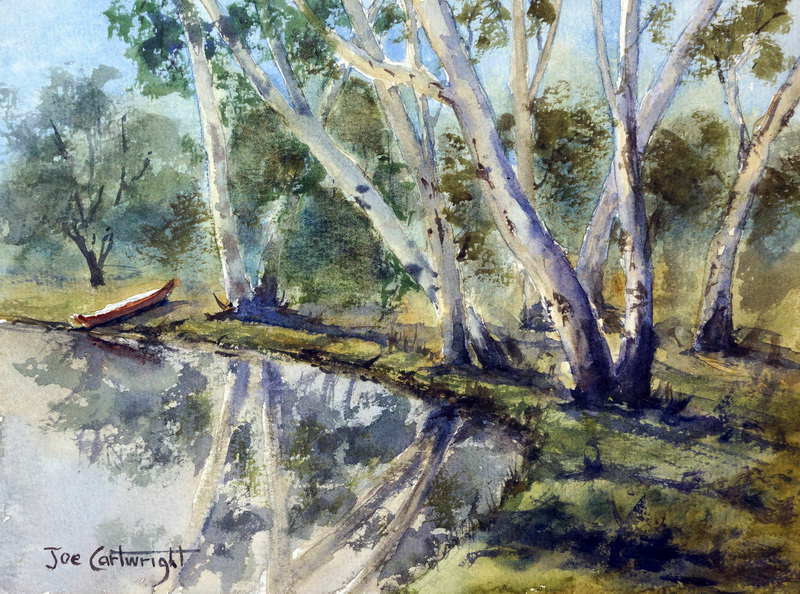 Watercolor painting plein air at Manning Creek by Joe Cartwright. Boxes used as easel. These polystyrene boxes in the photo above were used by people that wanted to float their gear across the creek – they made a useful easel. It was very late in the day so had to paint fast in fading light. A further complication is that I had a number of people come up to me wanting to talk including a family with four young children that each wanted to comment on my work and later came by to see the finished product! 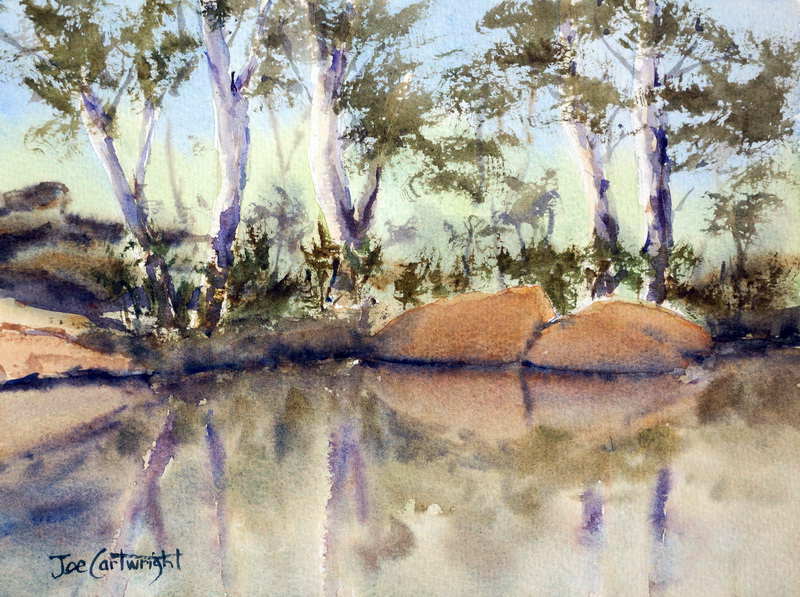 The gum trees on Lake Kununurra and their reflections made a great subject. I used a spare stool as an easel. The sun was a bit harsh making judging of tones harder, to say nothing of the quicker drying time. 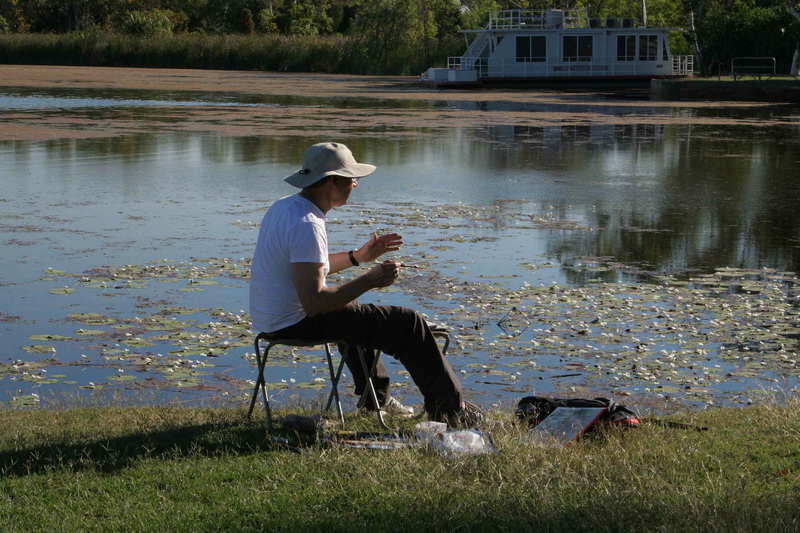 Painting plein air on an organised tour can be very challenging but worth the effort. Over the duration of the trip I only managed 5 paintings, though I took many photos. Most days we arrived in camp after dark or were so pushed for time I had no chance to paint. However the trip was a wonderful experience and the few sketches and paintings I produced are great mementos of a once in a lifetime trip!